The Income Tax Department informed another organization, involving Part An and Part B, for Form 16 of every 2013. As you would know, Part An originates from the TRACES site while Part B is made by the business. There are pay and expense subtleties in both Part An and Part B. Indeed, even following a long time since the new arrangement was presented, we find numerous finance chiefs not being clear about the premise of compensation and assessment figures in Part An and Part B of Form 16. Any business who deducts assess on compensation needs to record what is called Form 24Q, the quarterly return which exhibits the pay paid to a representative and the duty deducted/transmitted for every worker each quarter. Annexure I of Form 24Q presents the deductee shrewd (worker savvy) subtleties of the pay paid (in the section with the heading "Sum Paid or Credited") and the duty deducted for every representative (in the segment with the heading "All out TDS (Total of segments 321 and 322). In the event that an association runs regularly scheduled finance, and a representative has pay and assessment reasoning for all the 3 months in a quarter, Annexure I of Form 24Q ought to contain the compensation paid to and the duty deducted from every worker (according to worker PAN) for every month in the quarter. This implies every worker who gets compensation for every one of the months in a quarter ought to have something like 3 lines against his PAN in Form 24Q. Presently, what is implied by "Sum Paid or Credited" in Annexure I of Form 24Q? The Income Tax Department has not determined the correct importance of the above term anyplace. Associations have comprehended the term as alluding to the gross pay paid to a representative every month. When a Form 24Q is documented, the assessment office refreshes Form 26AS of a representative with the pay and duty subtleties displayed in Annexure I of Form 24Q. 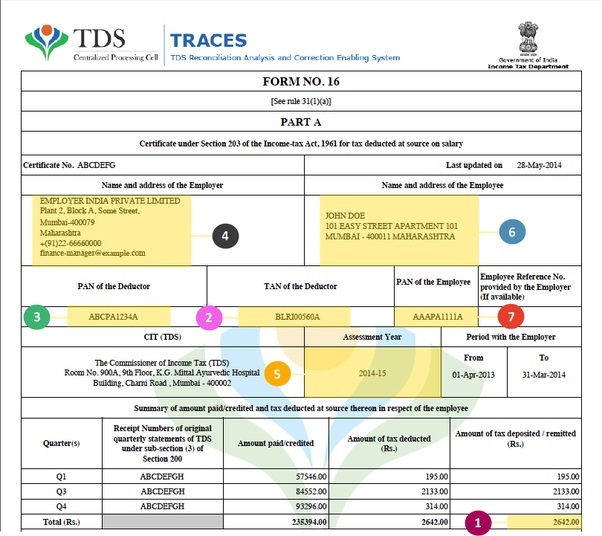 What's more, the assessment division utilizes Annexure I data to populate Part An of Form 16 which is downloaded from the TRACES website after Form 24Q for the last quarter is recorded. The compensation (Amount paid/credited) and assess sums (Amount of expense deducted) in the above are from Annexure I of Form 24Q documented each quarter. The Form 24Q petitioned for the last quarter (Jan to Mar) of a duty year ought to contain information in both Annexures I and Annexure II (conversely, Form 24Q for the initial 3 quarters contains information just in Annexure I and Annexure II is left clear). Information in Annexure I of Form 24Q (last quarter) gets into Part An of Form 16 while Annexure II information contains the complete pay paid, charge exclusions/findings guaranteed and the TDS for the year. The Annexure II information is the thing that the Income Tax Department considers for confirming the yearly duty obligation on a representative's compensation. Additionally, the Annexure II information should coordinate with the compensation, assess exclusion and TDS data gave in Part B of Form 16 issued to representatives. Should sums in Part An and Part B coordinate? In a perfect world, the all-out expense sum appeared under "Measure of assessment deducted" in Part An of Form 16 should match with the duty sum appeared against "Assessment payable" (aggregate of Income Tax, Surcharge and Education Cess) in Part B. On the off chance that the duty figures don't coordinate between Part An and Part B, we can presume that there has been either under or over conclusion of assessment from a representative's compensation. Shouldn't something be said about the pay figures between Part An and Part B? Numerous finance administrators contend that the pay figures in Part An and Part B should coordinate, notwithstanding the duty figures. We are of the view this is off base. The pay figures between Part An and Part B require not to coordinate for the accompanying reasons. 1. A worker may not highlight in Form 24Q of each of the 4 quarters. As indicated by the Income Tax Department, a representative need not include in Form 24Q until there is an assessment finding. In any case, once there is an expense reasoning for a worker, the representative should include in Form 24Q, relating to the quarter in which the assessment conclusion happens, and keep on highlighting in Form 24Q until the last quarter. For instance, if a representative has no duty derivation in April, May and June months, the business requires not to demonstrate the worker in Annexure I of Form 24Q of the primary quarter. On the off chance that the representative has imposed conclusion in June, the business needs to highlight the worker in Form 24Q of the second, third and fourth quarters – regardless of whether the worker does not have any assessment derivation after June until the year's end. In the above model, the absolute pay sum appeared in Part A of Form 16 issued to the worker will be the entirety of the compensation paid to the representative from June to March. Interestingly, the compensation figure in Part B of Form 16 will be the absolute pay paid to the representative from April to March. 2. Prerequisite esteems are not ordinarily appeared in the compensation sums appeared in Part A. The pay sum appeared in Part B incorporates estimations of perquisites gave to representatives while Part A may not contain the equivalent. For instance, perquisite estimation of intrigue free advances gave to workers is incorporated into the compensation sum appeared in Part B of Form 16 while the "Sum paid/credited" in Part A does exclude the perquisite esteem. 3. Some tax-exempt repayments may not have appeared in Part B. A few associations incorporate completely non-assessable repayments, (for example, phone charge repayment) in Part A while forgetting such repayments in Part B. The Income Tax Department has expressed that the all-out compensation sum crosswise over Annexure I (Part A pay figure) of the 4 Form 24Q records in a year require not to coordinate with the complete pay sum appeared in Annexure II (Part B pay figure) of the final quarter Form 24Q. As it were, compensation sums between Part A and Part B of Form 16 require not to be equivalent. The Income Tax Department has presented an alarm in its assessment form utility from the year AY 2015-16 and on-words Financial Year. 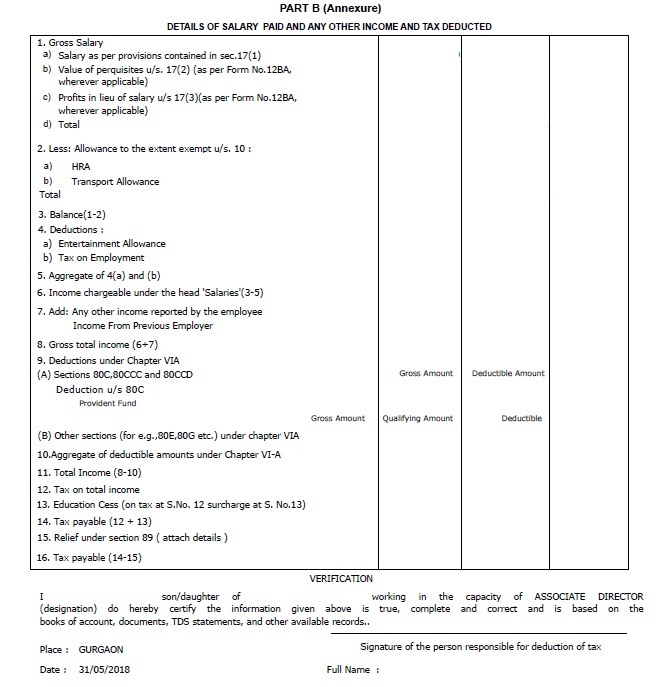 In the arrival utility t, here is a tab titled "Salary Details" in which assessees ought to enter the pay from pay rates. In the event that a representative has worked with only one business consistently, he ought to enter (against "B1" in the over) a sum which ought to be equivalent to the "Pay Chargeable Under the Head Salaries" introduced in Part B of Form 16 issued by his boss. In the arrival utility t, here is another tab called "Duty Details" in which the division displays the compensation and assessment subtleties according to Part An of Form 16. 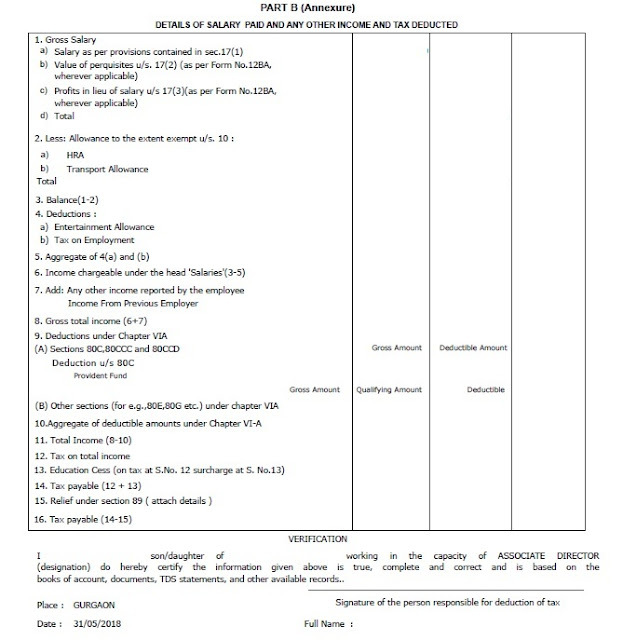 The figure under "Pay Under Salary" in the above is the all-out Part A pay sum. In the event that the "Pay from Salary" figure in the "Pay Details" tab is under 90% of the compensation exhibited under the "Expense Details" tab, the arrival utility shows the accompanying alarm message. Does the alarm imply that Part A and Part B pay figures ought to be equivalent? The appropriate response is no for the accompanying reasons. 1. The Part B pay figure entered in the arrival utility is after Section 10 exclusions, (for example, the House Rent Allowance exception) and henceforth the figure can't be equivalent to the Part A figure except if there is zero Section 10 exclusions. 2. The alarm gets activated just if the Part B compensation is under 90% of Part A pay. On the off chance that the Part B compensation is over 90% of Part A pay, there is no caution. Subsequently, the alarm ought not to be translated as showing that the Part An and Part B compensation figures ought to be equivalent. In our view, the alarm just fills in a suggestion to the assessee to re-check the numbers to ensure precision. In the event that every one of the figures is right, an assessee can click "alright" on the alarm screen and present the arrival regardless of whether the Part B sum is under 90% of the Part A sum.